Ultraviolet B (UVB) radiation is responsible for the majority of cutaneous damage following both acute and long-term exposure, and is believed to be the most important etiologic agent in human skin cancer. 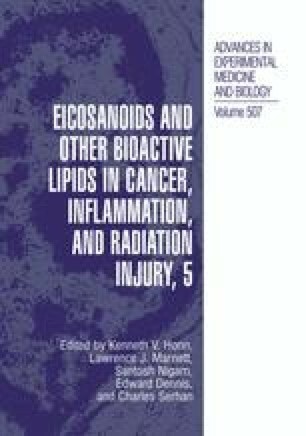 UVB carcinogenesis initially induces an inflammatory response characterized by edema, dermal infiltration of leukocytes, as well as the production and release of prostaglandins, which may be critical to the observed damaging effects of UVB light on skin. Recently, a specific cyclooxygenase-2 (COX-2) inhibitor, Celecoxib, was developed, which inhibits COX-2-induced inflammation without inhibiting the cytoprotective function of cyclooxygenase-1 (COX-1). Studies have demonstrated that oral administration of Celecoxib decreased the incidence of skin and colon tumors. Recently, the process of inflammation has been linked to tumor formation. The present study examined the effects of a topical application of Celecoxib on the acute UVB-induced cutaneous inflammatory response. We show that topical Celecoxib treatment effectively reduced many parameters of UVB-mediated inflammation, including edema, dermal myeloperoxidase activity, neutrophil infiltration,and prostaglandin E2 (PGE2) levels. By inhibiting this inflammatory response, topical Celecoxib treatment could ultimately be effective in preventing tumor development and progression in the skin, which is known to result from long-term UV exposure.